Sentinel were appointed as Sustainability and Ska Rating Consultant for the first of 2 Hammerson office relocation projects. Sustainability and Ska Rating were placed very high on their agenda. Ska Rating criteria were factored into the Employers Requirements and design standards during the early design phases. This allowed for the careful selection of new materials, incorporation reused fixtures and fitting fittings from Hammerson’s Head Office and the specification of intelligent and energy efficient Mechanical and Electrical solutions. 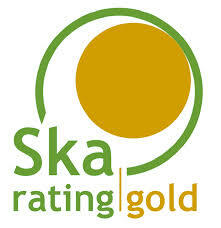 A Gold Ska Rating was therefore achieved with a limited impact to project budget and timescales.